When Abigail, this adorable little pup, was diagnosed with megaesophagus, her family didn’t simply give up on a “defective” dog like so many cruel owners have done in the past. As its name suggests, the ailment affects the esophagus in such a way that it remains enlarged instead of pushing food down like normal. Because of the condition, food remains stuck in the esophagus unless something is done to help it into the stomach. 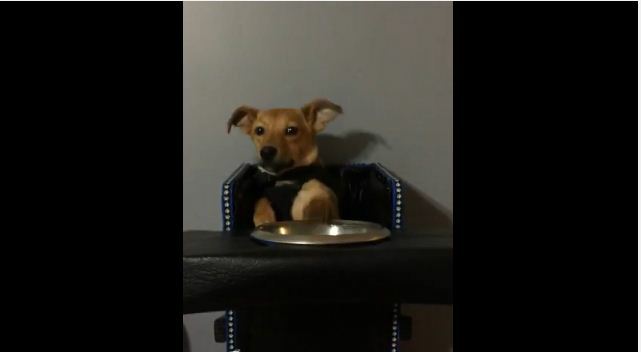 This pup’s family found a simple solution: a high chair. The custom seat uses gravity to help her eat and process food just as well as any other pooch. It’s also handy for a quick game of peekaboo! It’s so heartwarming to see a family this dedicated to keeping their dog happy and healthy.